Should the words “one-storey house” conjure up visions of outdated and neglected bungalows, prepare to be amazed, for today’s piece shows just how stunning (and super spacious) a ground-floor house can truly be. 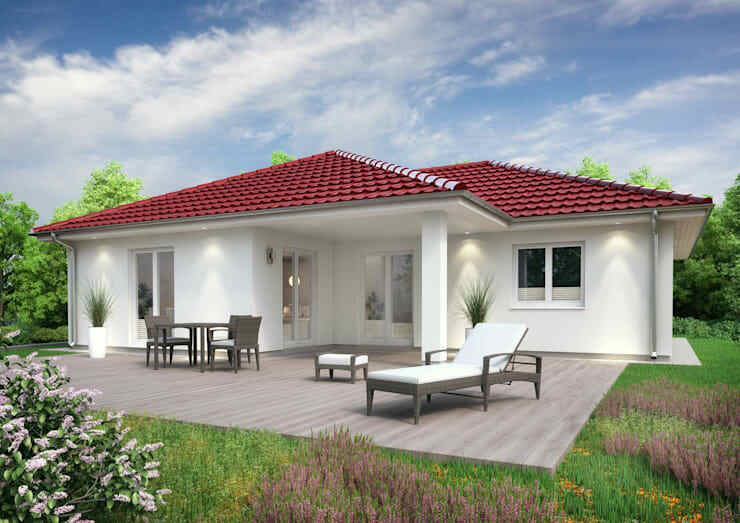 Far from just being the preferred architectural style for older generations, one-storey houses have been growing in popularity thanks to the innovative designs being perfected by architects worldwide. And when you stop to consider how much easier it must be to live without stairs, you'd be crazy to not at least consider one-level living. One of the most crucial factors of any house is its façade colours, and even more so when it comes to smaller structures, seeing as we need a lot of light neutrals to make that house look a bit more welcoming and visually spacious. It’s no secret just how much character and style a good old brick wall can flaunt. 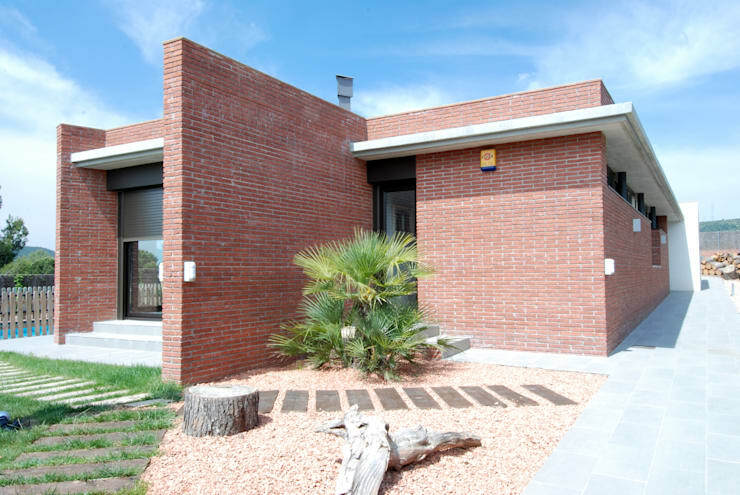 Here, with this modern design, the red bricks make such an impression, adding warmth and charm to what could have been a minimalist home. Plus, those arty wall placements look simply extraordinary. We’d feel like we were permanently on holiday with this one! The bold striped façade really stands out, offering insight into the tastes of the owners, while a bamboo terrace cover adds some tropical style. 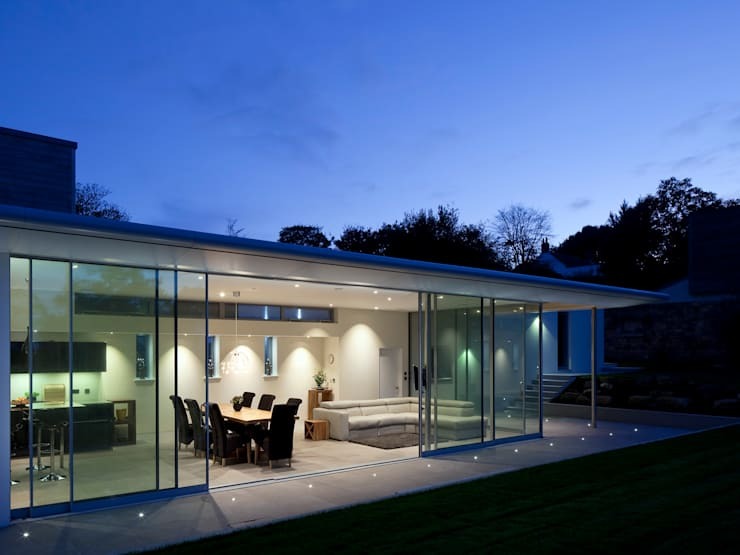 Talk about super modern designs – who would dream about calling this one-storey structure old-fashioned? Those chic glass walls, open-plan layout and dazzling lighting fixtures ensure that this design climbs to the top of many people’s lists. 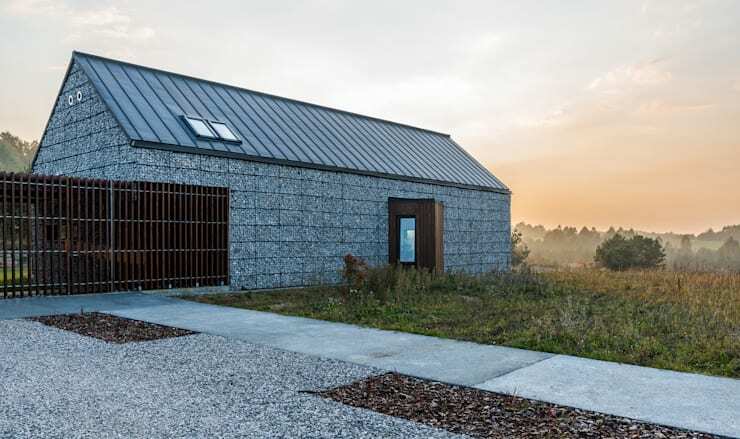 Looking every bit like the traditional farm structure, this home is quite unique. Gabion stone walls make a rustic impression, and with a long, lean shape, the interior must be delightful. With a high ceiling, can't you just imagine how glorious it must be to sit in the living room, looking up at those beams? Any one-storey home can go all out in terms of charming finishes on the outside, as this fabulous grey and white number proves. 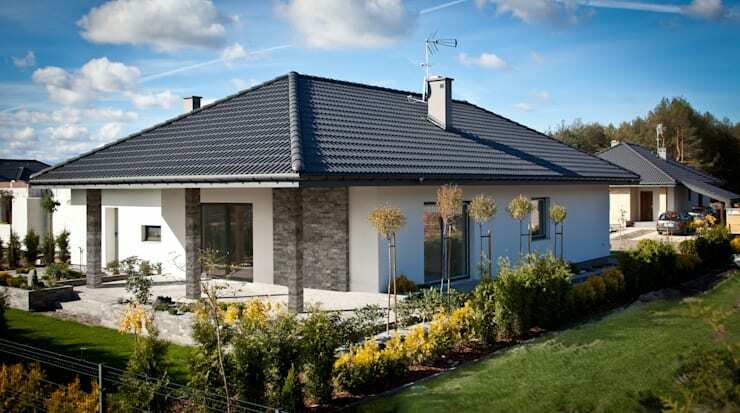 Although it’s quite a simple house, the addition of grey stone cladding has elevated it to dream home status in an instant, whilst that dark roof lends a contemporary edge. It’s not the size that counts, it’s what you do with it… As long as you account for all the rooms you need, why have a huge mansion when you'll never use its full potential? 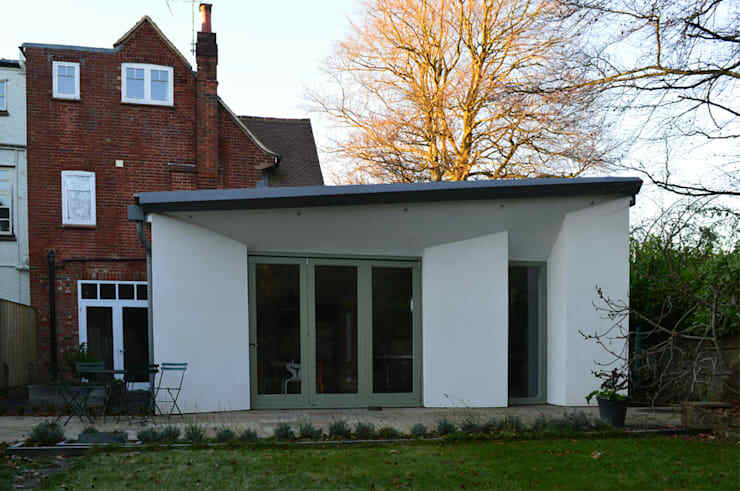 This small, modern and striking property proves that small can be impressively stylish. This charming little home takes one-storey design to the next level by adding fascinating concrete support structures that wrap around the house, creating such an artistic vibe. 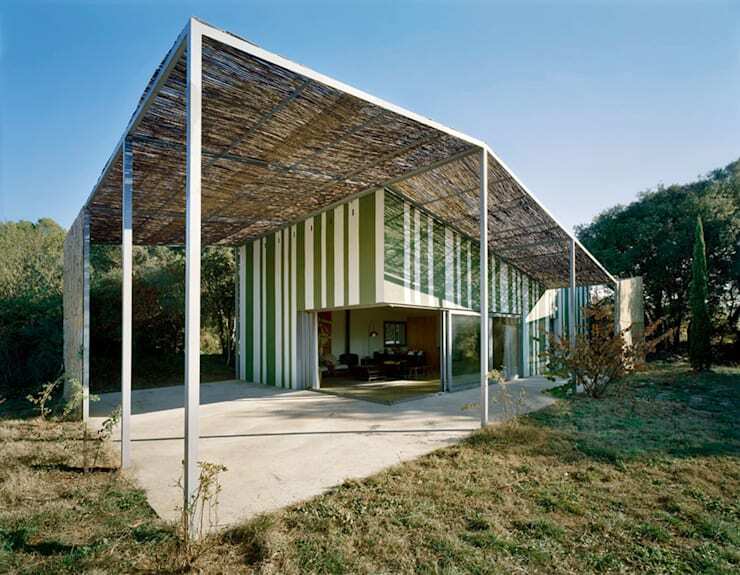 And see how beautifully that carport has been added to take full advantage of the garden’s size. Thanks to the magnificent features and finishes of our last example, it is worlds away from being deemed old-fashioned. 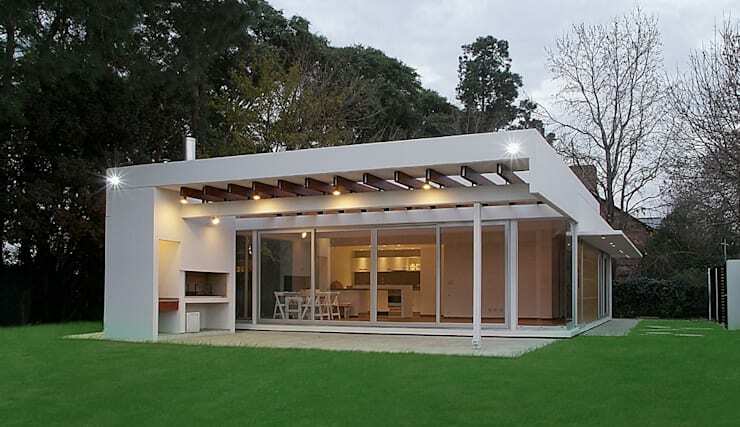 Look at the chic style of that roof, walls and the overall style of the property. Remember that one-storey homes are also much cheaper to build (in most cases), meaning you have some budget left for fantastic extras like a fire pit, a pergola, or perhaps even a splash pool out in the garden? See these 12 ideas to make a small garden spectacular. Which of these one-storey homes could be your dream house?